In a large skillet, cook the bacon over moderate heat until crisp, about 8 minutes. Drain on paper towels, then finely chop. Pour the bacon fat into a small bowl and let cool; refrigerate until solid. Preheat the oven to 400°. In a bowl, whisk the flour with the salt, baking powder and baking soda. Add 5 tablespoons of the cold bacon fat. Use your fingers to gently blend it with the flour until the mixture resembles coarse meal. Stir in the cream and chopped bacon until a loose dough forms. Scrape onto a lightly floured surface and knead gently until smooth. Roll out the dough to a 10-by-12-inch rectangle about 1/2 inch thick. Cut into 2 1/4-inch squares and transfer to an ungreased baking sheet. Bake the biscuits for 22 minutes, or until golden. 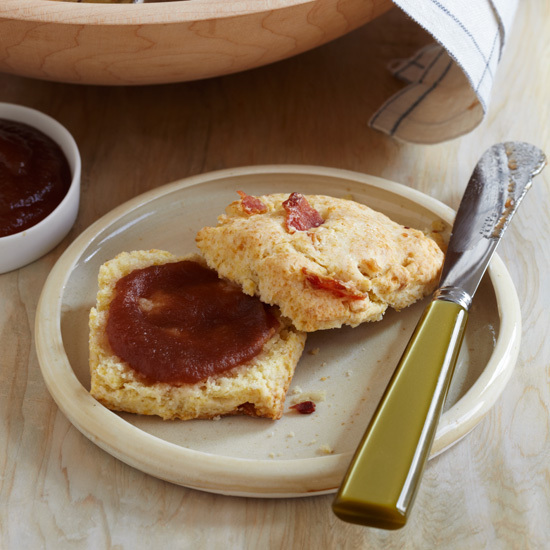 Let cool slightly on a wire rack and serve with Roasted Apple Butter.